Business Architecture Associates (BAA), having just delivered a week of business architecture training in London to leading companies and government agencies, is pleased to announce additional public and virtual training offerings for 2018. Really informative and insightful course and good to have people who still practice the profession delivering the course – it really made it come to life. BAA will deliver a week of business architecture training at each of three locations in 2018: Rancho Cordova, CA; Chicago; and New York City. The week-long training series will be repeated at each location and focus on immersing attendees in the discipline, establishing a robust baseline, leveraging the discipline to deliver business strategy, setting up and governing a practice, and leveraging business architecture to drive IT strategy and solutions. In addition to these formal course offerings, BAA will offer an end-of-week, hands-on practice session where attendees apply what they learned throughout the week and gain valuable takeaways that can be applied immediately in their own organizations. In addition to its onsite options, BAA has added a unique Virtual Training Option that allows individuals to attend from anywhere around the globe. Virtual attendees will engage in presentations, discussions, and working sessions as if they were in the room. The virtual option for 2018 will be delivered in conjunction with the New York training sessions the week of September 17th. 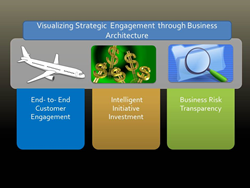 All business architecture courses are taught by business architecture thought leaders Whynde Kuehn and William Ulrich. Ms. Kuehn and Mr. Ulrich are Certified Business Architects®, cofounders of the Business Architecture Guild®, and leading authors. They are also hands-on practitioners, continuing to mentor businesses worldwide in the art and practice of business architecture. Business Architecture Associates is a Guild Accredited Training Provider™ (GATP®). All publicly delivered, formal training courses are aligned to “A Guide to the Business Architecture Body of Knowledge®” (BIZBOK® Guide) and the Guild’s Certified Business Architect® (CBA®) program. Check the BAA website for additional training dates and related announcements. For more information, go to http://www.businessarchitectureassociates.com.